This is the second in a series of interviews with our amazing volunteers. These are ordinary Members of Doula UK, who do extraordinary work, often very much behind the scenes, to run our organisation. I have been a doula since November 2007 and have supported 100+ births and many postnatal families, from all walks of life, nationalities and massively diverse circumstances. I was a Recruitment Manager for a FTSE 100 firm for fifteen years before joining Doula UK. I spent the first six weeks of 2006 on a life support machine in multiple organ failure, with sepsis and pneumonia, and my family was told I would die. My children were six months, three and five, and I nearly didn’t see them grown up. It took me a year to physically recover and many more years to get over post sepsis PTSD. My heart was no longer in big business, making lots of money and working crazy hours….Then I read an article about doulas and the rest is history. I am 43, have been married to Jim for nearly 19 years and have three children (Emily 17, Tom 15 and Dominic 12), two of whom are taller than me, and the other isn’t far behind. I live in a pretty rural area between Oxford and Aylesbury, with a Chocco Lab and two black cats. I love good food and wine, spending time with my family, reading and cooking. I go to Jazzercise between five and seven times a week, so am curvy on the outside and pretty fit on the inside! I am generally pretty laid back and my house is a pretty laid back place, there are always people around and extra people dropping in for dinner is a pretty regular thing. I say I am a full time doula. Most weeks I work at least two nights, but never more than six. I make sure I am home to see the kids off to school, then I do paperwork, have breakfast, and go to Jazzercise (it’s a cross between Zumba, kick boxing, aerobics and yoga, set to music, and is great to me as I can’t think about anything but the routines when I’m there or I fall over my own feet!) Then race home, have a shower and go to my postnatal clients. I’m am usually home by 6.30pm to make supper (which I mostly cook from scratch). I have a few hours with my husband before starting nights at 9pm, or I have my feet up before a last dog walk and going to bed at around 11pm. Saturdays and Sundays I watch the kids play football or cricket, run my daughter to ice skating, sometimes go to shows, and catch up on housework. Usually I try and do my antenatal visits at the weekend, and go to interviews whenever I can fit them in. I volunteer at the local hospital on Saturday afternoons, showing two tours of expectant mums round the unit per session. I also sit on the MSLC so have a meeting once a month there too. My original role within Doula UK was being a Doula Mentor, which I did until I took on the role of Doula Mentor Coordinator. I was then persuaded to join the Board, and then took on what was the embryo of the now Feedback, Referrals and Complaints department. My experience from a commercial background has been very useful. I am now Head of Feedback, Referrals and Complaints and deliberately sit separately from the Leadership Team. 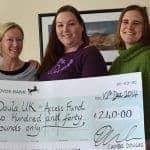 I can spend up to 20 hours a week on Doula UK work. I love helping people who are genuinely in need of help sort out difficult situations. External complaints are sometimes complex and often very emotional, and occasionally heart breaking. I have had cause to interact with various hospital trusts and in many cases have been instrumental in opening really positive dialogue about the role doulas play. My experience in this role, I one hundred percent believe, is the reason I find my personal interactions with midwives and health professionals to be mostly harmonious. It is difficult when I am asked to resolve interpersonal issues between members. We’re looking at ways to help members resolve such issues between themselves or with the support of other volunteers, as its crucial that the Feedback team is able to focus on external issues as they arise. I am basically living on borrowed time so my motto is ‘don’t sweat the little things, enjoy today, and don’t surround yourself with people or things that poison‘. You can read Eleanor’s doula profile here.